Good news! America's credit card-assisted President, Barrack Obama, is set to change the credit card system and protect credit card holders. This is the dawn of American democracy redefined as a government of credit card holders, by credit card holders, for credit card holders! 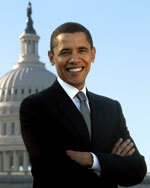 "Americans know that they have a responsibility to live within their means and pay what they owe," Mr. Obama said. "But they also have a right to not get ripped off by the sudden rate hikes, unfair penalties and hidden fees that have become all too common to our credit card industry." Obama should know. His campaign was funded by internet donations driven by online credit card contributions. Which meant that the more money he raised, the more credit card companies smiled all to the bank. But it is not good for the baboon to be working, while the monkey is eating. Neither should the credit card companies use the paws of politicians to pull chestnuts out of the economic fire. So if the monkey cannot work, it should at least eat sparingly. "There is no time for delay," he said. "We need a durable and successful flow of credit in our economy, but we can't tolerate profits that depend on misleading working families. Those days are over." …And the people of the Land of the Brave and Free say, "Amen!"